The time was the 1930s, and America, like much of the world, was mired in the midst of the Great Depression. Jobs were gone, bread lines were common, and times were admittedly hard. Yet, to borrow a phrase from Charles Dickens, “It was the best of times, it was the worse of times.” for the darkest days for our country were the beginning of the Golden Days of radio. Americans needed distractions from the cares of the day, and radio had captured the American imagination like no other invention before. One could now “listen in” to the world, bringing news from around the globe into the living room each evening. These were the halcyon days for the radio amateur as well, with radio stores popping up in small cities and towns, offering knowledge, parts and supplies to the budding home brewer. It was American ingenuity at its best, with whiskey shot glasses becoming insulators for the tuning capacitor, wooden breadboards and kitchen cake pans becoming the chassis for the latest receiver or transmitter creation, and tinfoil and plate glass becoming transmitting capacitors. With funds limited, the time honored tradition of home brewing or building your own set, was the word of the day. Those who bought “commercial jobs”, or assembled sets, were often looked upon with disdain, (perhaps even with a tad of envy) for breaking tradition by the more experienced of the amateur community. Although fone modulation was in use, CW was still the dominant mode, as it was simpler to build, therefore less expensive to the cash strapped amateur. Vacuum tubes were costly, and therefore most sets consisted of simple oscillators with one stage of gain, MOPAs, Hartleys, TPTG were the rule of the day. In late 1931 into this mix entered a new radio firm, the Gross Radio Company. Originally located at 25 Warren Street, and later at 51 Vessey Street in New York City, Gross Radio was founded by Jerry Gross W2AAE, after he left Leed’s Radio. Gross had worked at Leed’s designing radio kits, right down the street, in the area which later came to be known as “Radio Row”. During the 1930s, Gross Radio thrived, and ads could be found in a number of radio publications, including QST and Short Wave Craft, offering a variety of kits and assembled units. In fact the monthly QST ads were often ¾ or even full page, on the level of much larger companies like National and Leeds. As these were the days of the Great Depression, many amateurs lacked the funds even to buy a radio kit, much less an assembled unit. So, aside from Gross transmitters and receivers, the company also sold radio parts and products manufactured by other radio firms. In one QST ad, the header began with “If We Don’t Carry It In Stock, We’ll Get It For You.” Gross also offered custom building for the discerning client, proudly advertising that “Our lab is equipped to build anything to your own specifications.” A Wednesday “Code Class” was even offered in the store from 6:30 to 7:30PM, with the advice to “bring your own phones.”. 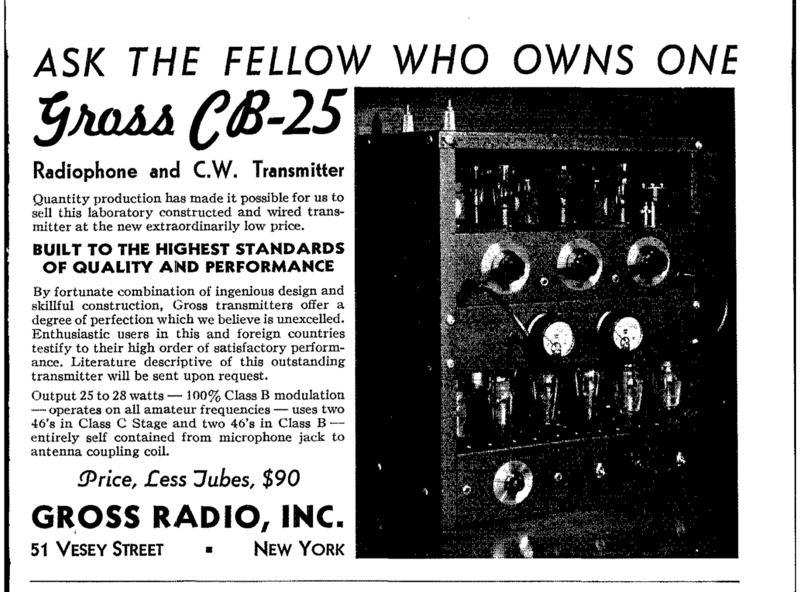 The Gross CB-25 seems to have first marketed in the March 1934 ARRL publication QST, one of many products from the Gross Radio Company of New York City. The “CB-25” is best explained as the “C” stood for CW, the “B” for class B fone modulation, and “25” for the 25 watt RF output. This particular Gross Radio transmitter was originally owned by Bill Orr W6SAI, and given to my friend John Rollins W1FPZ SK to restore. With John’s passing the unit came from his estate to my care. Overall, the transmitter is in remarkable condition thanks to John’s restoration efforts, but I’d like to find out a little more about it. Unfortunately W6SAI is now a silent key, so this may be a story left untold. Bill Orr W6SAI, the author of the famous “West Coast Handbook”, held high praise for the Gross, writing about it in at least two articles in CQ magazine. In these pieces Bill shared his joy of visiting “Jerry’s Place”, drooling over the various designs, and then heading home to build his own. At some point in later life, Bill became the proud owner of at least Gross transmitter, a story he shares so well in his February 1977 CQ article. Bill relates that in 1976, while browsing a flea market, he came across a mint CW-25, reigniting his childhood love of the sets. I’ll not spoil by attempting to relate Bill’s experiences here, suffice to say that Bill enjoyed the Gross so much that he rounded up yet another Gross set, this one making its way to Maine, and this is where our story really begins. A short time after I became a ham back in the mid 1990’s, my interest turned to the older 1930s sets. I joined the Antique Wireless Association, a group dedicated to collecting, documenting and restoring old equipment. Being involved with the AWA I became aware of a man named John Rollins W1FPZ who lived on the Maine coast. John was quite renowned for his building abilities, and had at that time just taken over one of the AWA’s on air contests from an ailing Bruce Kelly W2ICE. In 2001 I moved to Maine, and later up the Maine coast, just a short drive from John’s home. John, aside from his wonderful building skills, was a most generous person with his time and materials. He was always willing to help out the radio newcomer, often building and giving away his creations. For me, John was a source of inspiration and knowledge. He was always ready and able to answer a question, assist with a part for my latest restoration. Sometime in the late 1990s, Bill Orr became aware of John also. Perhaps it was John’s article on restoring a Gross set in the 1998 AWA Old Timer’s Bulletin, or maybe it was just John’s reputation. In either case, Bill called John with a proposition, restore my old Gross transmitter, send me the photos, and you can keep the rig! Well for John this must have been irresistible, for it was his chance to get his hands on yet another Gross, John was likewise a fan of Jerry Gross’s creations, and a chance to bring a dead radio back to life. John was not about to let a deal like that go through his hand, and was prepared to fly out in his private plane to pick up the rig from Bill in San Francisco, but a friend stepped in, and offered to drive out to California and retrieve the rig for John. Soon the rig arrived back in John’s workshop in Arrowsic, Maine where it underwent a full restoration, Rollins style. Any correspondence that passed between John and Bill seems to be lost with John’s passing earlier this year, but John never ceased to proudly point out the rig when showing a visitor his ham shack. The CW/CB-25 was quite robustly built as well, starting with the steel chassis, finished with the classic black crackle paint. The three air variable capacitors featured prominently on the front panel were General Radio products, as were the dials, printed with the Gross lightening bolt logo. Such quality was surprising for a bargain kit of its day, for General Radio was well known as a manufacturer of very high quality parts and equipment. Underneath the layout is a very traditional design, with straight-line heavy 12 gage tinned wire was used for the ground and RF bus, and 14 gage black insulated wire used elsewhere. A mixture of ceramic and fiber sockets are used for the coils, vacuum tubes and electrical connections. Two air variable capacitors, mounted on the rear of the top chassis, are used to neutralize the buffer and final stages. The RF circuit of the CW/CB-25 was based on the then popular type “46” tube, and the design was often referred to as the “46 job”. Starting from right to left on the RF chassis, a type “47” tube was used as a crystal oscillator as it would run on 160, 80, or 40 meter crystals. The 47 was designed as an audio pentode, but would provide decent RF output at 300 volts in a crystal oscillator. Output of the 47 went to a type 46 used as a buffer stage, which was neutralized for a vertically mounted capacitor located almost directly behind the tube. The buffer output was then directed onto a pair of 46s in a class C amplifier arrangement. A plug in coil was used for each stage, hence the need for three sets of coils per band. The crystal holder was mounted on the right front of the top panel, and Gross sold both the crystal holder and blank, you ground your own crystal in those days, for one dollar each. During the tune up process, one used either an external meter, plugged into the jacks on the front panel of the RF deck, or the tried and true light bulb with an inductive loop of wire. Each stage was loaded and tuned to resonance, with the one caveat that the phone jacks were live with plate voltage! The CW/CB-25, like most sets of the day, was designed for a high impedance balanced antenna, so the link coupled output, again via the plug in coil, went directly to a set of porcelain insulators. The modulator circuit on the CB-25 is a classic design that appears to have been taken from the early ARRL handbooks. A type “57” was used as the first stage in the speech amp, driving a single type 46 tube. The output of the single 46 was then sent into a pair of type 46 tubes in push pull, which used as modulators. Gross had designed the set for use with a carbon microphone, so the resulting audio was anything but “hi-fi”. Still the set did work, and offered a moderately priced entry into the fone band. A pair of type “83” mercury vapor rectifiers completed the rest of the tube compliment on the power deck. Connection between the two chassis was via a cable running from the power supply to the jack on the rear of the RF deck. A set of “wander” leads were used on the front panel meters to switch in, measure and tune the various stages of the transmitter. A lower power meter on the right was used with the oscillator and buffer sections, with the higher power meter on the left measuring 46 amplifiers in push pull. Keying was made via the front panel jacks, and a set of insulated dummy plugs were used to block following sections when tuning. Contrasted with the Collins 32B rig, selling at $125, the Gross was a real bargain. Sadly it appears that few of the CB-25 variants survive today, its unknown if this was result of poor sales, or just the ravages of time.